Flippers.be - The story behind the development of the Stern Orbitor One pinball machine. I'm very proud to present you this piece of history. It's the story of how the Orbitor One pinball machine was developed. This game is very unique, it was the first (and still only) pinball machine where the ball rolls on a three-dimensional shaped playfield. All other pinball machines use a flat (wood or sometimes plastic) playfield. The game also has some unique features like spinning bumpers. All this was never seen before in a pinball machine. I really love this game (I own one) I had researched the development of this game in the past already, but had not found a lot about it. Only a post in the rec.games.pinball newsgroup that said the game was not developed in-house by Stern, but by an external company in Aspen. Not much more was known about its history. It seems now that Orbitor One has a similar history as the Gottlieb Black Hole pinball machine had. 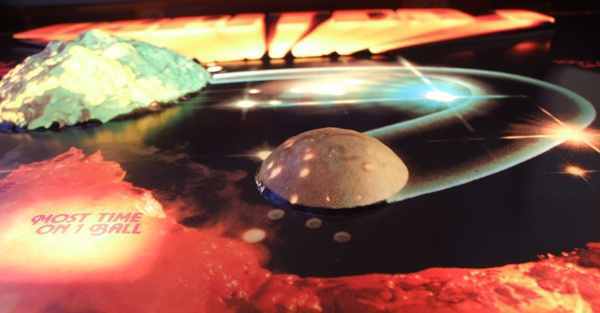 Black Hole was also developed by an external person who had an idea (having multiple playfields), and sold this concept and new ideas to a pinball company (Gottlieb). Not only that is similar, but Gottlieb was using computer chips designed by Rockwell, who helped NASA in their Space Shuttle program. It seems the designers of the Orbitor One pinball machine also have a background with NASA. And sneakers. 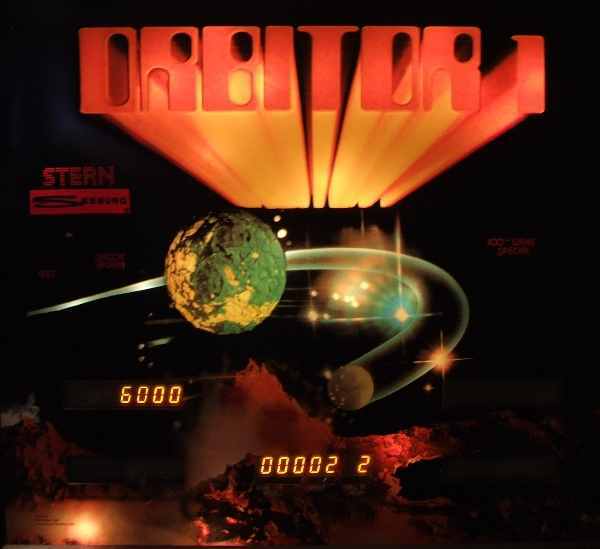 The pinball game Orbitor 1 was introduced by Stern/Seeburg in 1982. 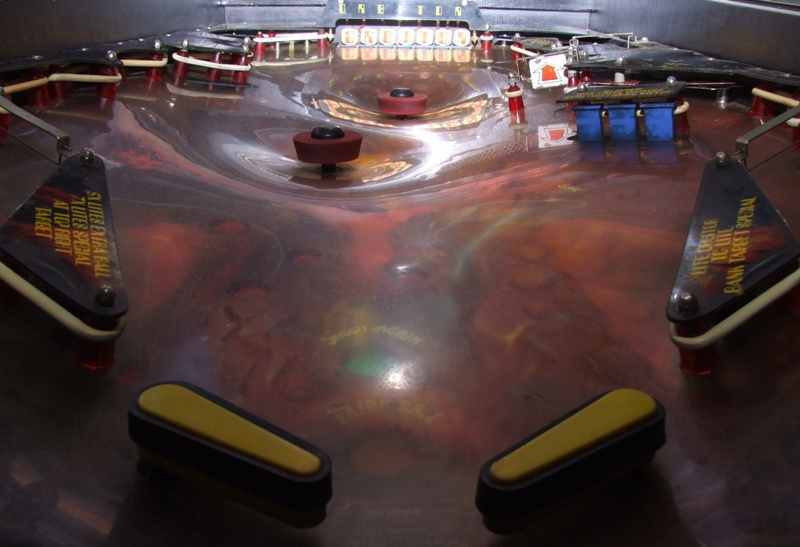 It was an all new concept for pinball as that the playfield was contoured, not a flat surface. 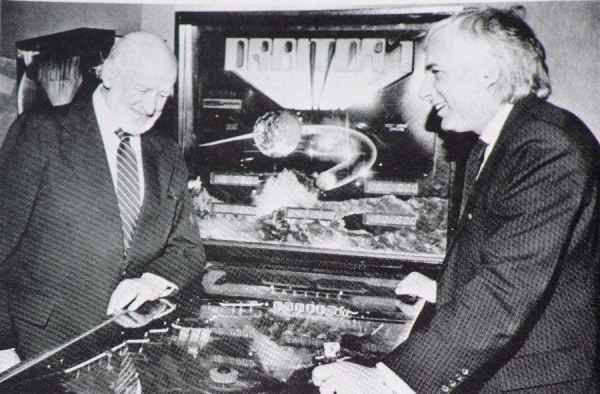 The video game industry was at the time replacing pinball as the preferred coin operated game of choice for the arcade business and Stern / Seeburg was attempting something totally different to compete. I was involved from almost the very beginning of this games development and write this up some 30 years later for your information. Dixie Rinehart and Al Gross had a small company (the two of them) named New Product Development People (NPDP) in Aspen, Colorado in the late 70's and early 80's. The two of them had worked for NASA as designers. As I understood it they were instrumental in the designing of the personal waste disposal apparatus for the astronauts. Dixie had also designed a glove (for which he has a patent) that allows for functional use of the thumb and forefinger. Dixie and Al were each one-of-a-kind. Both had great enthusiasm and imagination. In current terminology, out-of-the box thinkers. Now to Orbitor 1. Dixie had visited Washington, DC and at one of the museums had seen a semi-perpetual motion display consisting of a very smoothly surfaced bowl in which a large ball bearing was dropped and as it slowly found its way around the bowl to rest, it fascinated him by its action. His immediate thought was there has to be a game in there somewhere. He and Al looked around and decided that the arcade game industry was the place to start. How he got in touch with Gary Stern, I don't know. Stern had a condo in Vail, a couple of hours drive from Aspen, and he responded that he might be interested and why not meet with him in Vail on his next trip there to discuss their ideas and maybe they could bring some kind of model. Dixie and Al made a presentation to Disney World in Florida set up by Wally Schirra (astronaut they new from their NASA days) who knew one of the big wigs. NPDP was trying to do some 'entertainment' consultanting and product development. One of the ideas was a very large 'play field' (50 x 50 foot) with the 3D space concept somewhat like Orbitor 1. Dixie had seen the Einstien space time 'warping' example on TV. I saw it several times, too. It was a rubber sheet with a grid patern printed on it. When a steel ball, representing the mass of a object in space was placed on it, the rubber stretched and the grid was distorted, thus showing the distortion of space time as it passed the object or as the object passed through it. Not totally accurate, but interesting to watch. Guess it wasn't the bowl and ball I said, but I think that must of come from somewhere. Dixie's concept of the bowls and spinners came from this brainstorming. Anyway, this was all before contact was made with Stern. I saw the model they took to Vail so I know that was accurate. Also it was Al who thought for the Disney project, that flippers would be required all around the edge of the big field so people could be part of the 'game'. This probably lead to the pinball concept and to Stern. With not much time, they threw together a framed piece of plastic which was heated and depressed into a bowl shape, taped some checkerboard strips on the back side, grabbed a couple of ball bearings and headed to Vail. I can't do a good job of describing Dixie and Al, but enthusiasm and fun, fun, fun would be a start. I think the meeting started with wine and nibbles, and then more wine. I was told that the demonstration was with the three grown men on the floor rolling steel marbles in the plastic bowl with many big thoughts of the first 3-D pinball game. NPDP had a contract with Stern / Seeburg. It was a very generous contract and was to start almost immediately. When Dixie and Al got back to Aspen they got started with added space, ordering a vast array of pin-ball supplies from Stern and started looking for one or two employees. I was their first hire. Having an engineering degree, almost making a living as a sculptor, and being a skilled craftsman I think they got more than they realized at the time and I got a really fun job for the approximately year it lasted. Also joining us a few months later was another craftsman, John Kantana. 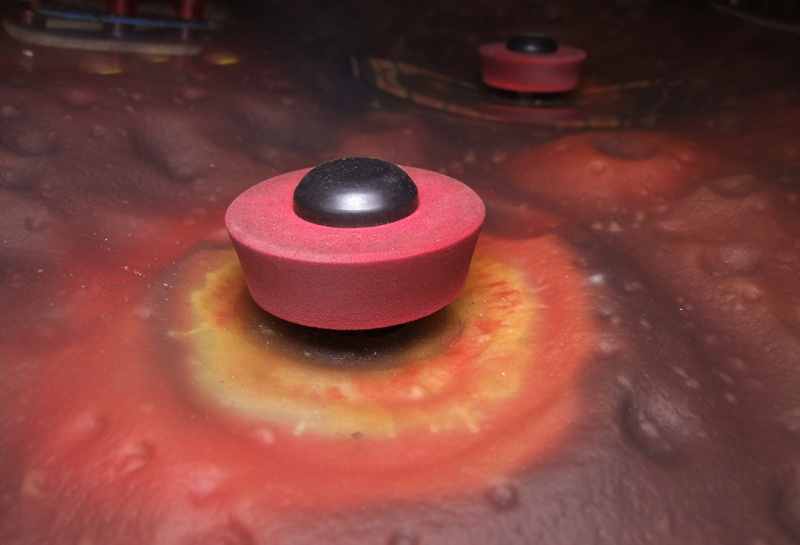 The first thing to note at the start, and something some of the reviewers of the game have touched on, was that Orbitor 1 was like no other pin-ball game. Part of the reason for that was that none of us knew anything about pin-ball. The second step was how do we make the 3-D play field. Fortunately Dixie had some knowledge of plastics and built a crude oven box to heat a sheet of plastic the size of a wide body cabinet. We used various thing to press the plastic as it softened, including shovels and various sizes of round light bulbs, and other odd shaped objects. After numerous attempts a play field was formed. The spinners were part of Dixie's original concepts of imparting 'english' to the ball and were made from tennis shoe sole material being evaluated by NPDP for Nike. I think I can be allowed to say it was at this point that my talents began to really be important to the development of the game. Not so much as to pinball game strategy (I knew nothing of that) but just to the mechanical and electrical construction of the game. Much, if not most, of the target, bumper, and guides were determined by the action of the ball as it traveled over the playfield contours. The first prototype we made was very much as the final production model turned out. In this picture you can see very good the curved, clear plexi playfield where the pinball rolls on. A 3D and painted plastic underneath it to give the illusion of the lunar surface. A close up of the rotating spinner. It's made out of the foam that's being used in sneakers ! It was just after the prototype was completed that Joe Joos, head designer for Stern/Seeburg, came out to Aspen, to visit NPDP, to see what these 'nut cases' were up too. I am not sure what his first thoughts were, but he played around with the game and seemed to like what we had done. As the prototype was being developed, Dixie started planning the graphics. He contracted with a local sculptor to make a plaster model for the back panel and a local fine art photographer to take its picture. The stars, swoosh, and ORBITOR 1, were added to the photo in the lab. It may be of interest that the original name was ORBITER 1. Someone had copyrighted that name so the E was changed to O. The same sculptor was hired to do the sculpture of the moon scape for under the clear playing field. I don't remember his name, but obviously he did a great job as both the back glass photo and the playfield graphics were used by Stern/Seeburg as provided. On our first trip to Chicago to visit Stern/Seeburg we got to see our game built up with the more complete hook up. You could call this the pre-production prototype. Jo Joos started playing it for us and scored an unbelievable(to us) high score. It was going to go into production. A plaster master had to be made for the vacuum former to make a forming mold and I spent the better part of two days smoothing and finely shape the master. It was then shipped to Chicago where a very state-of-the-art mold was made such that the playfields could be formed at a fast rate. A computer controlled cutter was programmed to make cut-outs and holes for assembly. I have to be a bit vague, but the actual prototype design was about 4 months. Understand that the prototype was the playfield, flippers, spinners, shooters, bumpers and targets. They were hooked up electrically to function, but none of the game enhancements such as sound , scoring, etc. In fact there was no back panel. Once Stern accepted the prototype as viable, they took over all remaining design and engineering to convert it to a functioning game. At about this point NPDP effort on Orbitor 1 was complete. Our new task was to start designing follow-up games. Two were developing at the same time. The one I remember most clearly was a two level game with a second identical (clear) playfield directly above the other with a drop down hole from top to lower and up ramp to shoot the ball from lower to upper. Imagine two balls in play on two levels with the same action. Now to wrap this up. Orbitor 1 was introduced at the 1982 Coin-Operated Game Show in Chicago (can't remember the exact name). It won an award and was favorably received. NPDP's contract had a generous royalty agreement and Dixie and Al thought that their ship had finally come in. They popped for all of us (4 plus wives) to go the show, hotel stay, dinners, etc. We also got a chance to see the entire production set-up. Jo Joos showed us around to see all the areas of the assembly and even a trip to the play field forming plant. Optimism was high. A side note: While touring Stern/Seeburg plant, Harry Williams, probably in his late sixties, was bent over a prototype board working on some target locations for a new game and called us all over to see his 'really great' new placements with almost childlike enthusiasm. All things come to an end, but this was really sudden. Shortly after the show several Stern/Seeburg executives came out to Aspen and toured NPDP and looked at our new prototypes. I think it was a Tuesday. On Wednesday they came back and announced that Stern/Seeburg had decided to discontinue their pinball division, stopping all production and that their use of NPDP was thus finished. Friday was my last day as a designer of pinball games and the last day of one of the most fun employment periods I ever had. Our overall involvement with Stern/Seeburg was about one year. Gary Stern (right) presents their new Orbitor One pinball machine to distributors. Picture in Playmeter Magazine, 1982. The sucess of Orbitor 1 was greater than I had known. Dixie said that interest after the show was quite good and that the European distributor had ordered 1500 games. I don't know what the U.S. orders were. When Stern decided to stop pinball, it was more than that. Stern-Seeburg went bankrupt. They could not fill the orders after that. So only the 800 plus games were ever built. Attempts were made by Stern to sell the concept to other manufactors, but they had no takers. Stern/Seeburg gave Dixie and Al several Orbitor 1's. They rightfully took the two prototypes and NPDP was to dispose of all the material and hardware they had sent as they saw fit. I think Al ended up on the east coast. Dixie is somewhere on the western slope of Colorado and at one time was successfully marketing his glove. Our daughters went through school together and they still correspond and see each other once in a while. I went back to sculpture, with a break to do packaging and parts procurement on a small computer project, and retired 8 years ago to live on a boat, first on the west coast and now on the east coast with the same wife I started out with in 1963. As to design credit, the idea (of Orbitor 1) was mostly Dixie's. The spinners came about as a way to get the ball out of the low spots and was also a way to impart english to the ball. The enhancements were added at Stern. I will give myself credit that I had the skill to build the prototype so that it would function as a game. Most all of the work on Orbitor 1 prototype was done by Dixie and me. You should understand that a working game had to be evident before Stern would proceed into a production design and start manufacturing. The thing that I liked was that Stern kept the basic game design with just a few tweaks. Update. Another part of Orbitor 1 history. Its original name was not Orbitor 1 but Orbitron 1. Because this name was already copyrighted it was changed into Orbitor. Here is the original photo used to make the backglass artwork. 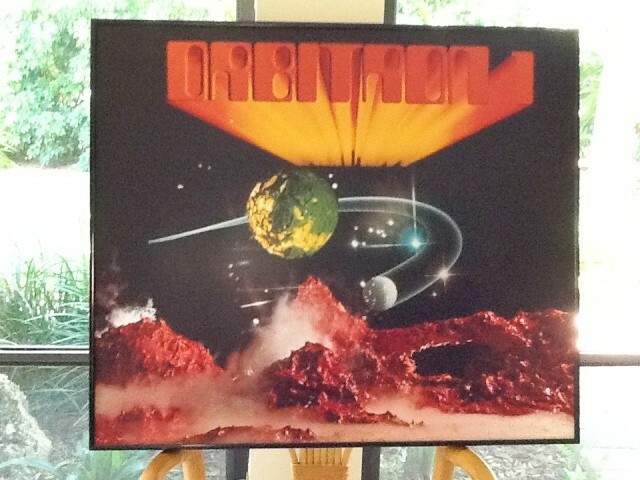 Note the name still says Orbitron 1 and not Orbitor.